The Surfing Madonna Foundation recently donated $60,000 to local causes. The nonprofit organization donated $20,000 to the City of Solana Beach toward its upcoming skatepark and $40,000 to the Encinitas Arts Culture and Ecology Alliance (EACEA) otherwise known as Pacific View, a former elementary school now turning into an arts and ecology center. They’ve donated $70,000 to this artful and ambitious nonprofit’s Pacific View project since January 2017. “We are thrilled to have such a wonderful community partner helping us transform Pacific View School into an Academy of Arts Culture and Ecology,” said Garth Murphy, founder of EACEA. Proceeds to make these donations come from the organization’s 2nd Annual Encinitas Half Marathon and Guinness World Record holder Surfing Madonna Beach Run. “The hard and talented work going on at Pacific View by EACEA and its members is something that needs to be recognized. Projects like these are helping create a more healthy, vibrant and fun community and they need our attention and support,” said Bob Nichols, president of the Surfing Madonna Oceans Project. “Since December 2013, the Surfing Madonna organization has donated over $360,000 directly back into community projects and programs that we feel are making a huge difference and the work being done by EACEA at Pacific View is inspiring." Starting in 2016, the City of Encinitas gave EACEA permission to do basic deferred maintenance, upkeep, security and exterior repairs, and rehabilitation to the existing buildings on the Pacific View School site. With funding support from the County of San Diego, Surfing Madonna Oceans Project and other private donations and community volunteer work, EACEA managed to complete all external building repairs needed to secure the dilapidated buildings. Now the focus becomes The Academy of Arts Culture and Ecology. This will include Departments of History, Music, Performing Arts, Fine Arts, Literature, Theatre and Film, Dance and backstage Arts, Technical Arts, Surf Culture/Entrepreneurship, Culinary Arts and an Ecology Centre. It will be an all ages learning center open all day, said Garth Murphy, founder of the EACEA that is overseeing Pacific View. 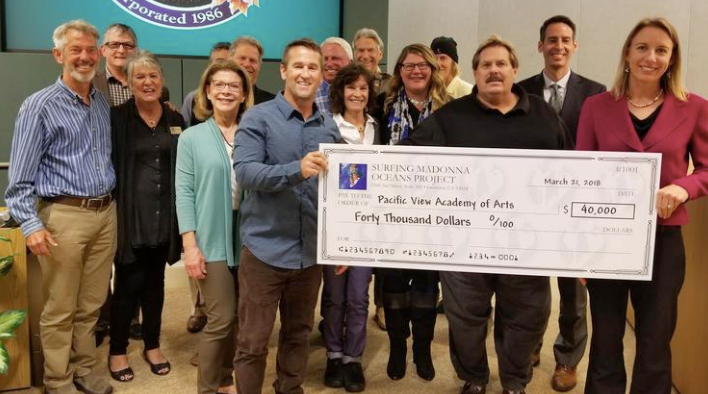 “Pease join us, as the Surfing Madonna Project, the City of Encinitas, the County of San Diego and hundreds of other donors and volunteers have, to make our local Academy of Arts, Culture and Ecology at Pacific View the beautiful, charming place of teaching and learning, earning and giving that we envision,” Murphy said. For more information on how you can help or get involved, contact www.EACEA.org.